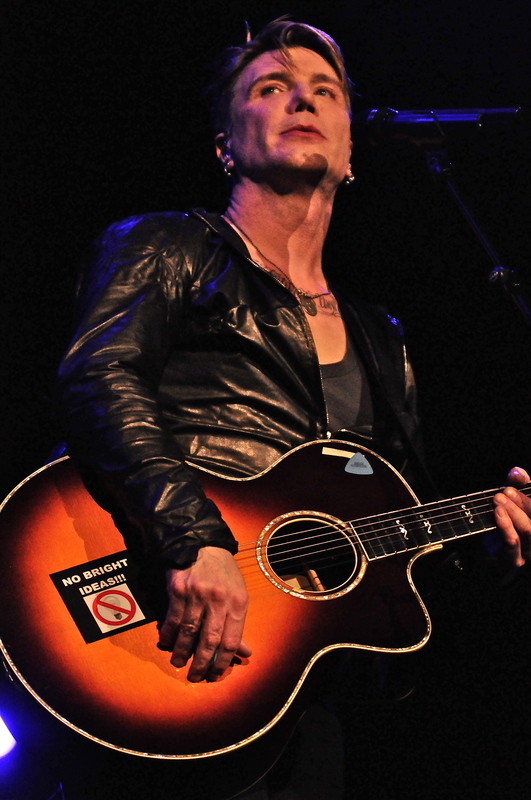 The Goo Goo Dolls returned home Saturday evening as they played their third area show in just under five months. Currently on tour with Daughtry and The Plain White T’s, the band played its usual August stomping grounds, the Darien Lake Performing Arts Center. Unlike the acoustic shows they played the last time they were in town, they came blistering right out of the gate with “Dizzy”. As the band then delved into “Big Machine” the opening cut from their 2002 release Gutterflower, the crowd roared to let the hometown duo of singer, guitarist Johnny Rzeznik and bassist Robby Takac know how much they are appreciated. Rzeznik tried to build up a little suspense as he paused and said “Wait for it” before delivering the famous chords to perhaps the fans choice for the band’s best song in “Slide”. The boys surprised the crowd with a rare play of “Naked” from A Boy Named Goo which had only been played a handful of times on this tour to date. Rzeznik followed up by dedicating “Name” to the hometown crowd. Bassist Takac followed with a pair of “January Friend” and “Bringing On The Light”, the latter from the band’s most current release Magnetic. The current touring lineup features guitarist Brad Fernquist, keyboardist, saxophonist Korel Tunador along with the newest member who joined this year, drummer Craig McIntyre. Oddly enough the band ended with “Sympathy” and the Supertramp cover “Give A Little Bit”, which incidentally was the exact encore last year. C’mon guys you couldn’t change it up a little? The overall set did feature a good mix of the band’s more recent albums but oddly enough nothing from Something For The Rest Of Us. There are enough songs in the bands arsenal to play two to three completely different sets if they so choose. While many longtime fans may pine for the golden classics from the nineties such as “Long Way Down”, “We Are The Normal” and “Fallin’ Down” to be played on a more regular basis, the band seems happy to cater more to the average fan per say. Inexplicably The Goo Goo Dolls fan base appears to getting younger in age despite the band having been around for almost thirty years. Let’s face it The Goo Goo Dolls have always been about Rzeznik and Takac. They were the ones who slogged their way through the Buffalo club scene before making waves when their song “Name” hit big and brought them to where they are today, getting played on contemporary radio stations all over the country. To see the smiles on their faces Friday night you can tell they truly enjoyed being up on that stage playing with a conviction like I’ve never seen from them. Not too bad for what started out as a little ol’ punk band from Buffalo. Chris Daughtry and his band played a solid seventy-five minute set that featured many of his radio staples such as top ten smashes “It’s Not Over” and “Home”. Daughtry was in fine voice and his vibrant stage presence helped his band set the tone of things to come later in the night. Opening the affair were Plain White T’s who played a fast paced thirty minute set which featured their number one smash hit “Hey There Delilah”. Special thanks to Ashley Ball for her assistance.